Cinque Cento (uttales med italiensk swung: CHEEN-kweh CHEHN-toh) er prosjektet til TD Nicholson fra Trondheim. Han har traktert bassen i diverse band, bla det Oslo-baserte Nansy, og vokalisten i Nansy bidro også på hans debut-låt Endless Summer som var å finne på Friendly Selection samleren (samt på b-siden av denne EP-en). Han hadde lekt seg med elektronika en del år før han i 2001 bestemte seg for å jobbe mer seriøst med sitt soloprosjekt Cinque Cento. Siden han er en bassist, så er basslinjene en essensiell bestanddel i Cinque Cento sin musikk. Hans lidenskap for monotone bass liner ble vekket da han oppdaget hip-hop og lignende genre tidlig på 90-tallet, dette, kombinert med kule beats og fengende melodilinjer, er essensen av Cinque Cento. A-siden på hans debut EP er dansegulvvennlig smooth og housa grooves, mens B-siden er viet mer avslappa downbeat. Cinque Cento (pronounced CHEEN-kweh CHEHN-toh) is a tiny Italian car. It also happens to be the musical project of T.D. Nicholson from Trondheim, Norway. He has been playing bass in various band, and he had already been dabbling with electronica for some years when he in 2001 decided to start working more seriously on his solo project Cinque Cento. Working like a true Cinque Cento – that is – slow and inconsistent - he eventually pulled his act together and produced enough material for a 12" release. Which is a good sign of things to come. Now on a creative roll, the project should probably be renamed Testasrossa (or something to that effect). Inspired by retro soul, funk and jazz, Cinque Cento is centered around monotonous bass lines, combined with groovy beats, dubbish sample treatment, as well as insistent melodies. Musically, Cinque Cento can be placed somewhere in the downbeat / nujazz / groovy beats area, ranging from smooth lounge to groovy, but still smooth house-ish grooves…. possibly with a little touch of dub sprinkled on top. 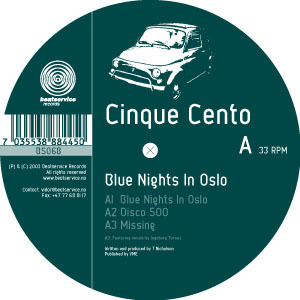 His debut 12", titled "Blue nights in Oslo", is scheduled for release in November 2003. A new EP, this time also featuring vocal tracks, is scheduled for the spring of 2004, while the debut album should be out by October 2004.